Discussion in 'iPhone and iPad Games' started by touchGames, Mar 25, 2016. Emergency! 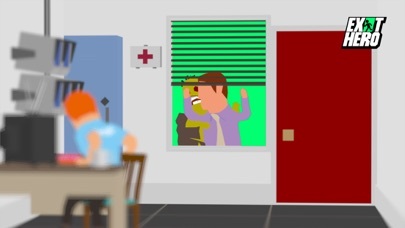 Zombies have appeared in the building out of nowhere! Rescue all the people in terror! 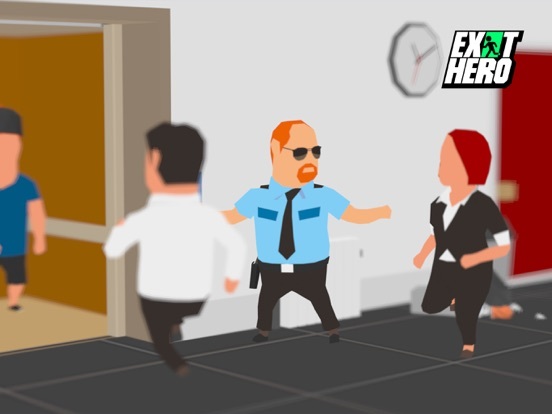 Play escaping puzzle action, Exit Hero! Features New style of escape puzzle action game. 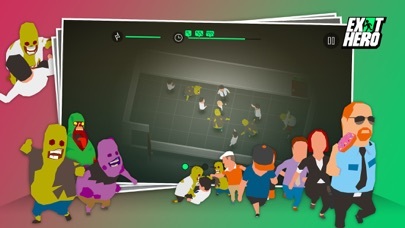 Rescue all the people within the ktime limit and escape through the exit. 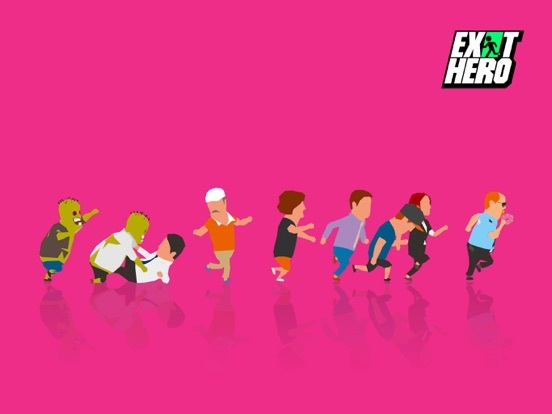 - Dodge & avoid zombies and rescue normal people - Escape faster using boosters and other items - Total of 99 polished zombie-filled levels - Collect over 30 unique heroes and hidden characters - Compete globally to become the top gamer with shortest time Will you be the one to rescue all and become the hero? Haha, nice intro and cool music! This is a snake type of game. You're playing as a guard of a building and try to save people from zombies. For the first few level that i've played, the zombies just stayed on the same spot.. not sure if the zombies will just stay on the same spot on higher level. One of the better Inspired by Snake - Games on the AppStore that has a couple of interesting twists that will make you enjoy it even more the longer you play the Game. 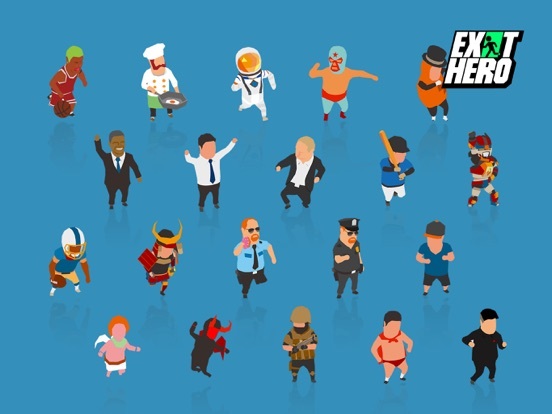 With a fair Ad-System that won`t hold you actually back from playing Exit Hero longer then needed I am sure that some might even consider supporting the Developer/Publisher with an InGame Tip by buying some of the Items in the InGame Store. What looked like a usual weekend opportunity for Steve (The Guard) to watch a Football Game and eat meanwhile a donut turned out into the longest Marathon Steve had run since he had dropped out of the American Guards Olympic Team. Their city was attacked by a bunch of Zombies and Steve was the only One in the Building who knew how to save everyone and how to operate the Lift and where the Keys for each Level were hidden. Steve always felt at some point like he was at some point controlled by some force outside his own powers that told him exactly where he needed to go to make sure he would pick up everyone on the different flools and made sure that they left the building and returned home in safety while avoiding at the same time those nasty Zombies that have managed somehow to get into the building at some point and now became a danger to everyone that was still inside the building. Considering that it was Easter and that some Company had their Office still open over the Weekend Steve wasn`t really suprised that some of the People inside the Building were wearing Costums and offered him their help in return for some of the Keys Steve would collect during his search for those that were still trapped inside the building. 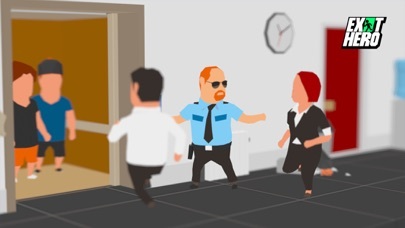 By making sure that Steve always tried to avoid to run into those Zombies while at the same time trying to be faster then his Inner Clock he was always sure he could obtain those three Keys he could find on every floor that was split into three offices. 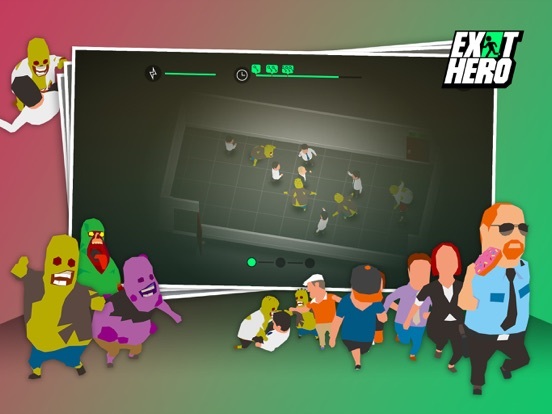 I really do enjoy playing Exit Hero simply because it`s one of those Just another Round/Try - Games and Hero Exit kept me busy for some time till I needed a break. Seeing that the Game does only show Ads InGame that can easily be closed without any forced Video Ads after dying in the Game it`s not such a big deal to die a couple of times in the Game even it does mean each time that your progress on a floor gets reseted when you die. After half an hour with the Game and seeing in what direction the Game does expand and how the Gameplay does improve with it I can only say that I really consider buying some of the InGame Items just to make sure that the Team back in Korea feel saver to keep the current Ad System in their Games instead of using a different one that might keep me actually from playing a Game by those nasty Video Ads. 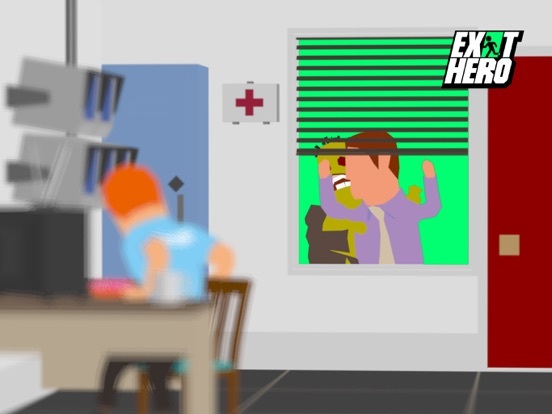 I can only advise those that like Puzzle/Snake Games to give Hero Exit a try since on the first look Hero Exit does not show it`s full potencial but playing a couple of Levels in it I`m sure many will be suprised how much fun it makes to find a way on how to control Steve through the hole floors while trying at the same time to obtain all three keys. 4/5 Donuts since Steve has eaten the fifth. Steve (the main character) has the ultimate reflexes and sees everything slowed down considerably, as if the zombies are just staying in place. Sorry I just made that up, but it makes it more believable. 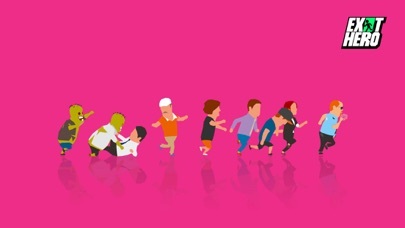 As you progress through the stages, you will see different types of zombies with different effects on you. Play to find out! Thank you Sanuku for the awesome review. A bit of humor and to the point. That wasn't our intention, but it does seem close. EDIT: okay, maybe I was a little blunt with my response below. Allow me to add a constructive response. To help with providing a game to people AND making money, perhaps the developers should adopt a "Crossy Road" type pay mechanic. Have ad removal as a pay option, collect in-game coins for random characters with the option to buy particular ones with real money. That way most people won't be funneled into making harsh pay decisions. Well damn! I feel a little ripped off, which is a shame really, the game plays great. Guys, before you make the dive to drop some money to remove ads, you need to know that you're still going to be stuck behind a paywall if you ever run out of keys. Keys are your ONLY form of currency. 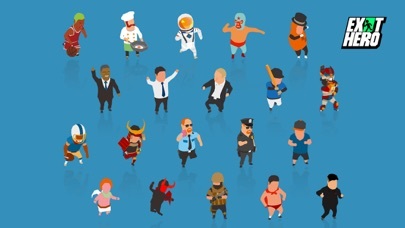 They are used to unlock new characters and unlock the next level. If you buy a new character before unlocking the next stage (like I did) then you're screwed. I had 7 keys after finishing the 3rd floor. I buy a character for an unspecified amount of keys only to find I'd ran out and I could no longer move up to the 4th floor. I could watch a video for a key of course, or I could buy a stack of 50 keys minimum for ANOTHER $6. The key increments go all the way up to USD$60 if you're feeling stupidly loose with your wallet. Watching one vid isn't a major issue in most cases, but having just one currency that does everything is where the monetization breaks for me. Really really love this game from the presentation to gameplay mechanics but I cant help but sulk about the monetization system. I would've gladly paid more than 6.99 up front. I dont mind ads, but having "premium only characters" is a bit aggressive. Of course, this is solely my opinion and I understand that the market should be a bit more lenient. However, if this game truly wants to stand out and profit, its going to have to alter its strategy. Because at this point, it's only scaring away people. This is a game for everyone If you're good enough, you can get characters and go to the end without spending. I literally passed this game up much because of the icon. Not sure what it is about it but it turned me away every time . After seeing a screenshots of the game not knowing it went with the icon I got excited and clicked the download link. It came up the game that I was avoiding and was like oh man of the icon just matched the game. Maybe just put exit hero in the icon or something or it could just be me. Anyways this game is so fun.